If you’re choosing to install one of our wonderful home lifts into your property, you’ll be happy to know that you have an array of options available to you in regards to their design. So whether you are looking to create a contemporary chic aesthetic or maintain a sense of traditionalism you can achieve it with our wonderful design features; especially when it comes to your choice of door design. So that you can choose the best design for you; here are your lift door design options explained. Swing doors are a great option for home lifts as they are solid, safe, durable, strong, and aesthetically fabulous. At Axess2 you can choose between an array of options including; a solid door, a vision panel door, or even a full glass panel door – the latter option is perfect for contemporary 21st century homes. We offer a range of RAL colours; so, you can easily complement and contrast against your chosen interior design. This style of door will add a sense of undeniable luxury to your home. Telescopic sliding doors are available in 2 panel, 3 panel and centre opening. Each door is complete with a Prisma operator with DC drive and encoder to ensure smooth and efficient operation. This door is available with a smooth or textured stainless steel finished and can also be manufactured with glass, for a more open and fresh look. We offer these doors in a range of skin plate colours. 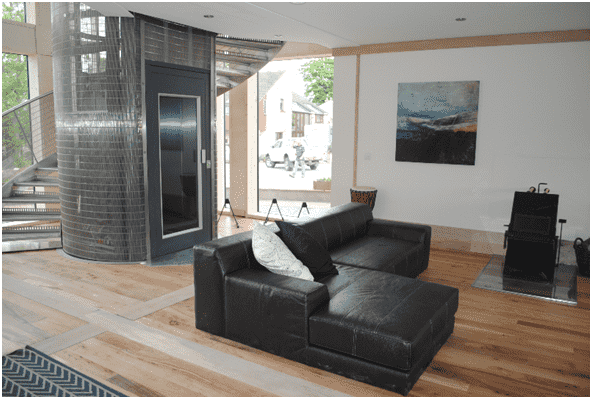 If weight or space is limited, Eco Bus Folding doors are the perfect option. This specialist door design will change the weight of the existing lift but will not affect the smooth operation of the lift. This door design is exceptionally reliable, light and strong. Like all of our lift door options there is an array of options available to you; you can choose from a range of stainless steel options, aluminium and glass finishing. These lift doors are RAL painted, so you can ensure that the colour of your lift works well within its interior surroundings. If you don’t think that any of the above options will suit your home, do not despair as we offer a range of bespoke lift door solutions. We can conceal lift doors so that they blend in with the specific interior design. If you require a certain colour or finish, we can use your own timber doors to provide you with the perfect option for your home. We offer a range of lift doors here at Axess2 so that you are guaranteed to achieve the desired aesthetic for your home that you have always dreamed of. We provide lifts for domestic properties and commercial premises. If you would like more information in regards to our lifts please get in contact with our helpful team. Simply call 01200 404 005 to discuss your options.